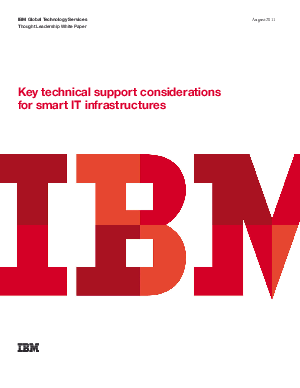 This white paper discusses the different support challenges that can confront you when implementing a smarter infrastructure that includes new solutions like cloud initiatives, virtualized environments and other new breeds of computer models. To keep these solutions running daily, you should consider the level of support that will be required. With technology clearly grow-ing in complexity, can your internal teams adequately supportyour operational needs now and still concentrate on innovation projects? Will you be able to grow and retain the skills needed to keep these systems running? You may need support on thefront end or someone you can team with to address end-to-end,ongoing support. Will you have to work with multiple vendorsin different locations, or will you have a single vendor and support contract? And finally, how do you ensure that you are optimizing the value from the new technology you have implemented?